I love pancakes. And my toddler has inherited that love. They used to be something I only made occasionally – on a lazy weekend morning or special occasion – but with Jake requesting them they’ve been in the rotation much more frequently. And, of course, my favorite recipe includes a heavy dose of sugar – and then I slather them in syrup. Perfect candidate for a recipe makeover! Instead of sugar, this version is packed with protein – eggs and Greek yogurt make these a great, filling option for the morning. Instead of being slathered with syrup, they’re topped with a compote of fresh strawberries and basil – and just a little honey. The result is a fresh, filling breakfast that satisfies the pancake cravings in a much healthier fashion. In a bowl, combine strawberries and honey. Let sit for 30 minutes, stirring occasionally, until the strawberries start to give up their juice. Stir in the basil just before serving. In a large bowl, whisk together the flour, baking powder, and salt. In another bowl, combine the eggs and yogurt. Mix the wet ingredients into the dry until all moistened. Drop batter by 2 Tbsp. heaps into a lightly-greased frying pan and spread out a bit. Cook until the edges are dry and flip, cooking an additional minute or so. 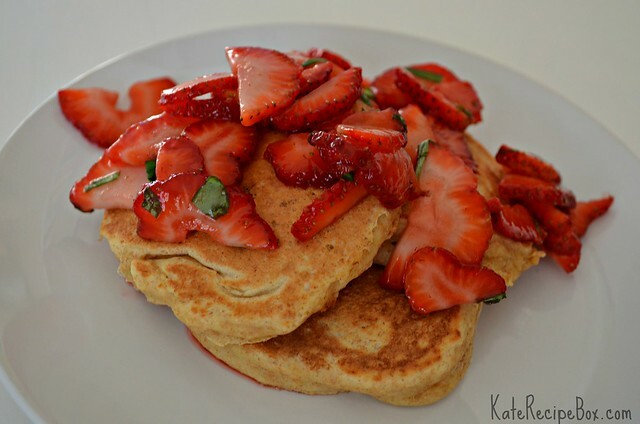 Serve pancakes warm, topped with the strawberry basil compote. I got to pick the theme for this month’s What’s Baking and picked cheese. Of all the cheese recipes I have marked to make, I kept coming back to this one. It just looked so good. And, it was. 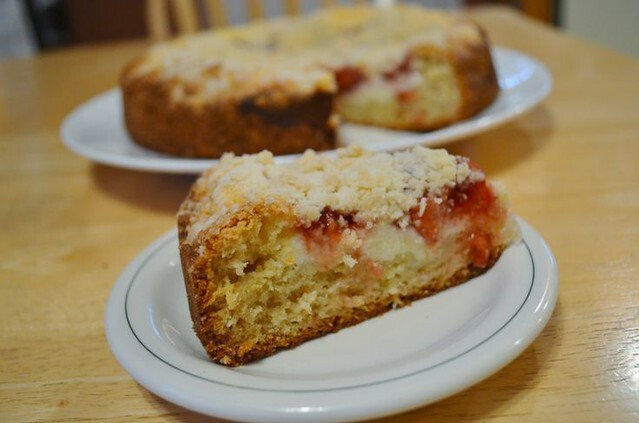 This is all from scratch – even the jam – so it takes a little bit of time and effort, but it’s so worth it! Check back later this week to see what other cheese delights got baked up! Chop the strawberries and toss them with sugar. If you want a more jam-like layer, finely chop the berries. I wanted distinguishable berry pieces in mine so I just gave them a rough chop. Heat them in a saucepan until they release their juices – about 5 minutes. In a small bowl, whisk together the water and cornstarch. Add this to the strawberries and stir to combine. Cook a few minutes until thickened. Remove from heat and let cool to room temperature. Using a mixer, combine the cream cheese, sugar and egg. Set aside. In a large bowl, stir together the flour and sugar. Cut in the butter until it resembles coarse crumbs. Remove 3/4 cup of the crumbs and set aside. To the remaining crumbs, add in the baking powder, baking soda and salt and stir. In a medium bowl, beat together the sour cream, egg and vanilla until well combined. Add this mixture to the large bowl of crumbs and stir until just combined. It will be lumpy. Grease or line an 8-9″ springform pan. Press the cake batter evenly into the bottom, letting it rise up 1/2″ on all sides, making a well. Pour the cream cheese mixture into the well. Top with strawberry jam. Sprinkle with reserved crumbs. Bake for 45-55 minutes, until golden brown on the sides. Let cool for 20 minutes before removing sides of the pan and letting cool completely.